PETR CECH INSISTS the uncertainty surrounding Arsene Wenger’s future at Arsenal is not “a huge problem” despite the club struggling for consistency. Speculation regarding the Frenchman’s position at Emirates Stadium has rumbled on for much of the 2016-17 campaign, providing an unwelcome backdrop to what has been a difficult season. Calls for the long-serving manager to be moved on at the end of his current contract have grown in intensity, with protests now commonplace and the ‘Wenger Out’ campaign a global phenomenon. 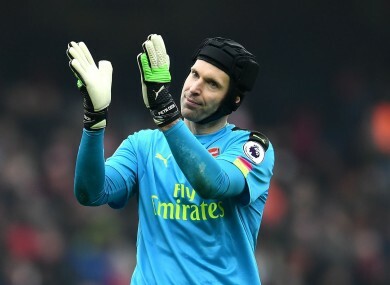 Cech, though, is adamant that the players do not view the issue as a distraction and it is no excuse for their struggles to secure another top-four finish in the Premier League. He told Sky Sports: “I think at this moment it is clear Mr Wenger is our manager, and he will be until the end of the season, and then he has the cards in his hands. We will see what his decision will be, but I don’t think it makes the situation more different. “You have the manager and you know you have to deliver the performances and you need to work towards the games to win the games, and everybody needs to do their best. Whether the manager stays or not, at this moment I don’t think it is a huge problem. Rather than try to shift the blame for Arsenal’s troubles this term, Cech admits that the players must look to shoulder the responsibility for failing to transfer their work rate in training onto a competitive stage. He added: “When you see the training sessions, after we beat Leicester and started preparing for Spurs, I thought we were in a good shape. We looked ready, and then obviously you don’t transfer the work, and this positivity if you don’t transfer it to the game, the performance can be like that. “This is disappointing because you try to work hard, try to prepare to put out the best performance, and there have been far too many games this season, especially in 2017, where we didn’t transfer that from the training ground to the pitch. “Everybody involved is so desperate to win the title, because it has been a long time, and this is probably where the frustration comes around. Year after year Arsenal have come very close, and in the end there is that missing piece. This is what adds together every year and the people can be disappointed. Arsenal head into a meeting with Manchester United on Sunday sat sixth in the table, five points behind their opponents and six adrift of the Champions League places – albeit with a game in hand. Email “Wenger's future at Arsenal 'not a huge problem', claims Cech”. Feedback on “Wenger's future at Arsenal 'not a huge problem', claims Cech”.